Bass Drum: 20" x 16"
Tom 1: 10" x 7"
Tom 2: 12" x 8"
Floor Tom: 14" x 14"
Here is a complete drum set from the famous Export series by Pearl in Jet Black. This drum set consists of bass drum, two hanging toms, floor tom and a snare drum. Supplied with a 5-piece hardware set and a 3-piece cymbal set. An ingenious Pearl Export drum set for beginners and Semiprofessional drummer with a super price-performance ratio! 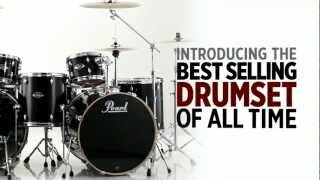 The Pearl Export Series is one of the best selling drum sets ever. A revised version of Pearl brings his world champion back into the Pearl program! In terms of sound and quality the export series can carry on from where it left off with its earlier successes. The shells are made of high quality poplar and Asian mahogany and are equipped with reduced weight Lugs. Thus optimum resonance behaviour of the drums is ensured. The Opti-Loc suspension Tom holder allows the drums to vibrate freely. 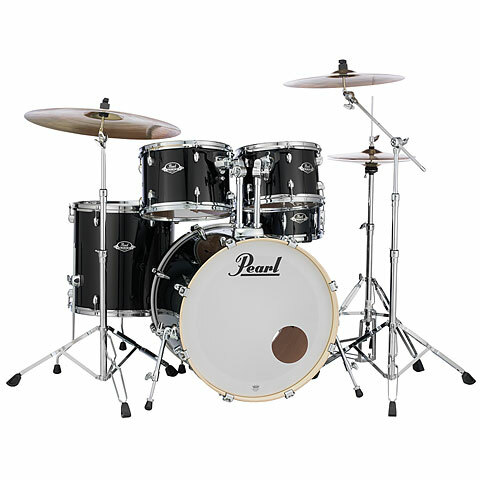 The sound of the new Pearl Export EXX set is extremely powerful in this price range. The bass drum sounds emphasizes crisply with good bass response, the toms sound full and warm with short sustain and a clear stop! No review for this product available. · Show all articles of the brand Pearl.